CARNIVORES – THE SOLITARY HUNTERS. 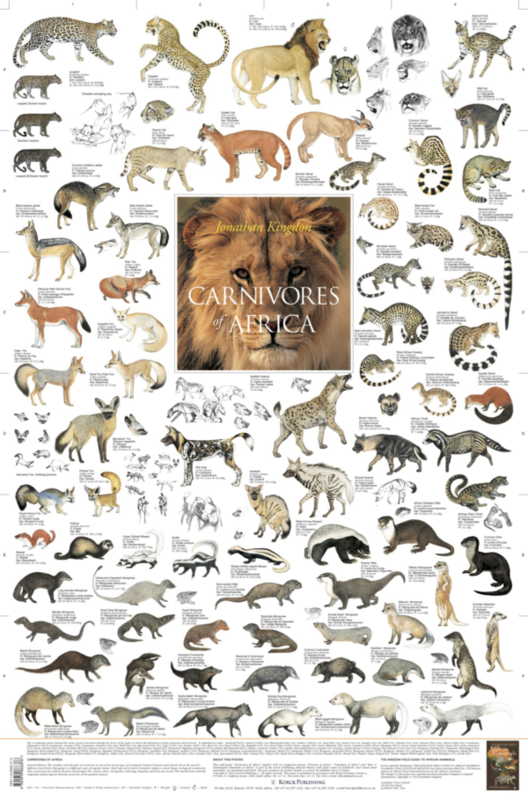 72 Carnivore species are brilliantly illustrated by Jonathan Kingdon in the Korck Publishing “Carnivores of Africa” wall poster. In Nature the number and diversity of carnivores is one of the surest signs of ecological richness because each species sits at the top of a different food chain belonging to a different cycle of organic matter. Each type of carnivore therefore implies a much larger ecological community. This poster will adorn any wall at home, in the waiting room, at the office or in school or university. It will make a perfect gift for all nature lovers.